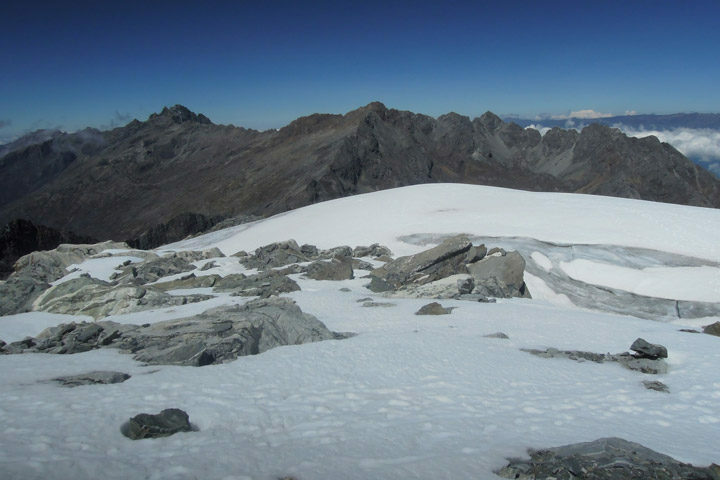 The retreat of Humboldt Glacier—Venezuela’s last patch of perennial ice—means that the country could soon be glacier-free. We featured the glacier in August 2018 as an Image of the Day showing how it changed between 1988 and 2015. 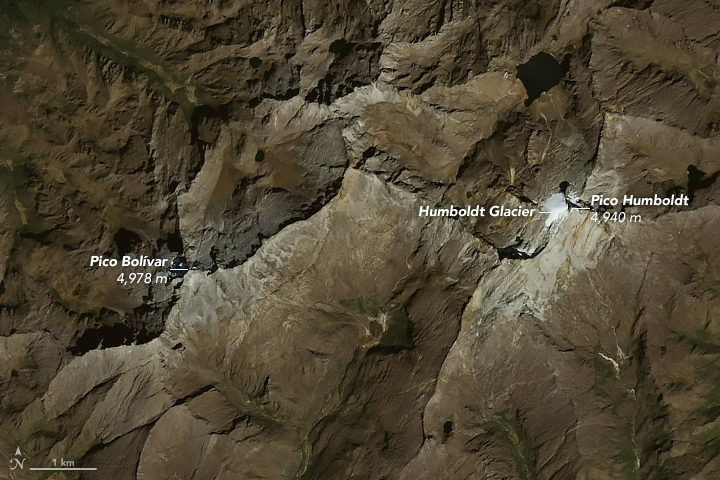 Satellite images can tell you a lot about a glacier, but direct measurements by people on the ground provide a unique, important perspective, especially for glaciers as small as Humboldt. 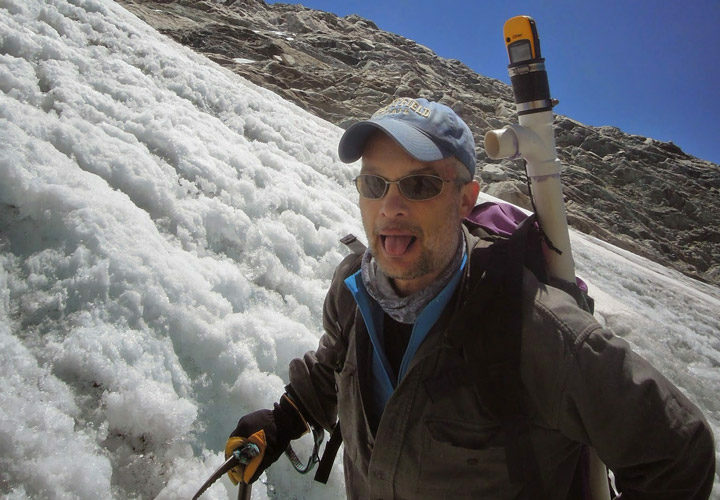 Carsten Braun, a scientist at Westfield State University, last surveyed the glacier in 2015. He talked about what it was like to stand on Venezuela’s last glacier. The Operational Land Imager (OLI) on Landsat 8 acquired this natural-color image of the glacier on January 6, 2015. 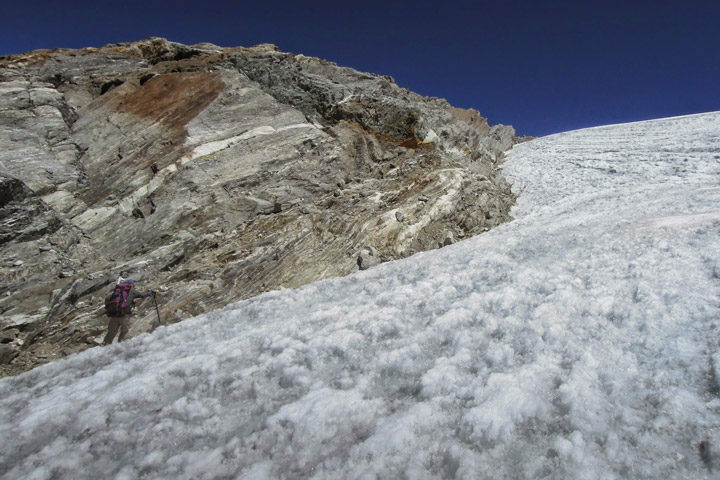 These photographs show the ground-based view of Humboldt Glacier in 2015. Photos by Carsten Braun. What things were you measuring during the 2015 survey? This was a very ‘low-tech’ trip: just me and a guide. The approach to the glacier takes two days of very rough hiking with big packs. That gets you to base camp at Laguna Verde below the glacier. To get to the glacier takes another three hours on rough terrain. This is definitely popular with climbers. They cross the Humboldt Glacier and then summit Pico Humboldt. I did the same thing in 2009 and 2011: I walked around the glacier right on the margin with a simple GPS receiver to make a map of it. That sounds a lot easier than it is. 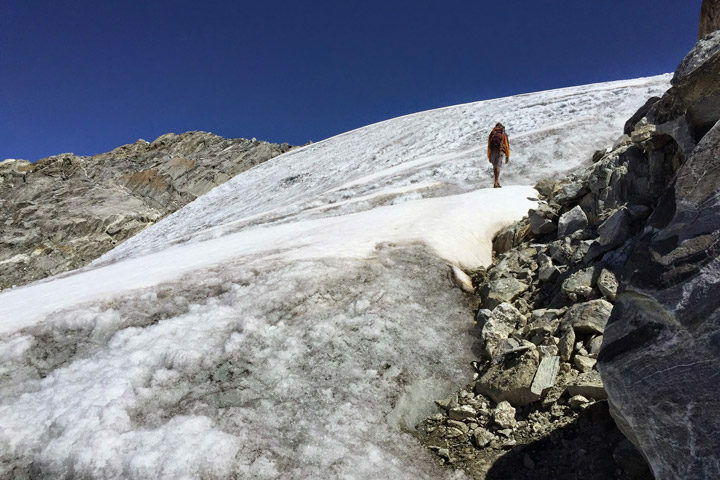 Walking right on the edge of a glacier can be difficult and dangerous. This was definitely both! What was the ice like? Parts of it look like snow or slush. This glacier is little different than what you may have experienced. It is tiny and does not have an accumulation area. The surface is 100 percent ice everywhere, just covered in some parts in wet seasonal snow that will melt away. Basically that means that the Humboldt Glacier has no means to ‘add’ mass (‘eat’) and continuously loses mass everywhere (‘fasting’). Obviously, that’s not sustainable. Do you remember what you were thinking while hiking on the country’s last glacier? I was definitely considering the impacts of losing this glacier. It has little ‘practical use’ today, as it is so small and pretty much irrelevant for water supply. Its disappearance would not impact water resources much, if at all. That’s much in contrast with countries like Peru and Bolivia, where glacier recession already creates huge problems for water resources, hydro-power, etc. The impact in Venezuela is more at a spiritual level. 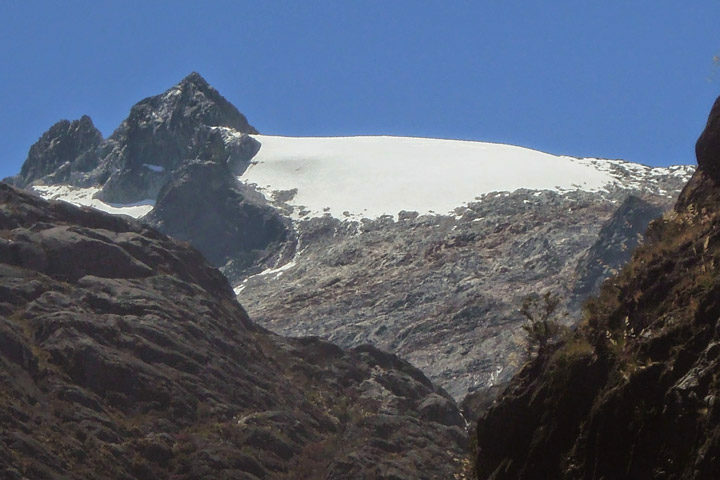 The mountain chain is was named Sierra Nevada de Mérida (snowy mountain range of Mérida) because of its glacier cover. Now it will be gone soon and may never come back again. (Well, that’s up to us humans to decide.) And with that, the reality of these mountains will change. The lack of glaciers will be the ‘new normal.’ It’s a little bit like losing a species: once it’s gone, you never realize that it is missing. This entry was posted on Thursday, September 27th, 2018 at 10:35 am and is filed under Ground to Space. You can follow any responses to this entry through the RSS 2.0 feed. You can skip to the end and leave a response. Pinging is currently not allowed. Thank you for reporting on this journey and your work. It’s another sad story in an avalanche of news about our planetary dilemma. May we soon get more common sense about taking care of our hospitable earth and ourselves in the future.